I’ve been trying something new but..
I’m still a landscape photographer at heart and the Fuerteventurian landscape has so much to offer. When clouds hang over the middle of the island and a few drops of rain are perhaps in the offing, not likely but maybe, of course I’m ready with my camera. After a wonderful day on the beach, much needed recharging of the batteries before facing the British Winter, this was the scene as we crossed the island from east to west. This entry was posted on September 30, 2017 by Chillbrook. 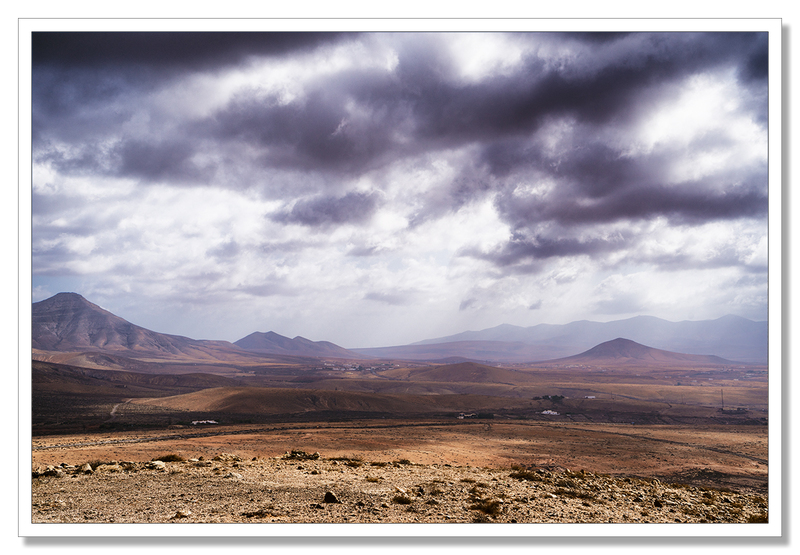 It was filed under Photography, Photography and Travel and was tagged with Adrian Theze, Cornwall Photographic, Fuerteventura, Landscape, Landscape Photography, Late Afternoon Light, Photography. The Fuerteventurian landscape looks so beautiful through your lens, Adrian. Both images are picture perfect postcards. How beguiling, almost like being on the moon, no palms on moon though! Nothing quite like a vast scene of beauty ~ although like most scenes of beauty, this one comes from desolation, and made so much better by the contrast and lighting Adrian. Such beautiful slopes and hues – and drama! – in the first picture, and your story about the second had me laughing in recognition – I’ve been there! I’m glad the Fuerteventura dry heat is seeping into your bones; I imagine it’s the perfect antidote to the coming weather. Yes! When we first moved to the Pacific northwest it was winter, and it was very depressing, mainly because of the relentless rain and sameness of temperatures – it hovers in the low 40’s (F) a lot and you can go seemingly weeks without getting a break of sunlight. In New York, it’s much more dramatic, changing day to day and going to extremes. And it’s dark here – that was hard. But I’ve gotten more used to it. I wish you a SAD-free winter, or if things go that route, I wish you a quick break, maybe in February…. Thank you very much Scott! Good to hear from you. I hope all is well. Enjoy your holidays, we seem to have the opposite weather to you and Chris in Norfolk. Thank you Klausbernd. Yes, I’ve been listening to R4 in the mornings on the BBC Radio player and I know what to expect when we return. It’s strange that we found 21 degrees this morning to be quite cold. By the afternoon it was 32 and we were quite comfortable. How quickly we adapt. I hope the weather improves for you. Best wishes, Adrian and Chris. we are very happy that autumn has arrived with clear, sunny weather, crisp air and a nice chill in the mornings and evenings. Actually we had enough summer and now we are looking forward to autumn and especially winter. That’s for us the cosy time sitting in the rocking chair in front of the fire reading. You know we are autumn and winter folks, we don’t like it too warm but love freezing temperatures, well, that’s our Viking blood. You enjoy the heat and have a great time down south. 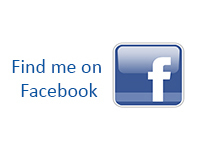 Thank you Klausbernd for your comment. I love autumn too but have really enjoyed the light and recharging my batteries ready for the low light we can expect in the winter. But, like you say, it’s a good opportunity to catch up on your reading in front of a roaring fire. Nice crisp frosty mornings are a great photo opportunity but sadly, we have few these lovely frosty mornings these days. Have a smashing weekend ahead. Best wishes from Chris and myself to the fab four of Cley! We wishing you an easy travel home 🏡 and the weekend will be sweet without a bitter feeling. Thank you so much to all of you. We had a late flight yesterday which meant we were able to get to that fabulous gem in the Fuerteventura crown, Sotovento beach which stretches for miles. We arrived early and were the only people on the beach for a very long time. It was quite magical. We were able to spend the whole day there and it was glorious. The flight back was uneventful and we got home about 5am. It’s great that it’s a lovely bright day today, albeit 20 degrees cooler than we’re used to, and that has helped us coming home. It’s lovely to see the trees turning and the hills look magnificent in the sunshine. We wish you happy days at home. Sunshine and joy. Zo’n mooi commentaar, Lou. Heel erg bedankt. I love that wide, open landscape in the first image, and how fortunate that the foreground hill on the Rt side was just in shadow when you tooke this image. There’s potential in the second scene – I’m thinking getting close and low and using a generously wide-angle lens. 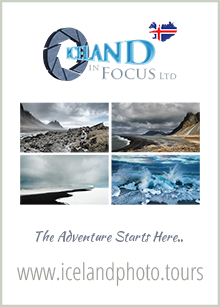 You’ve found some completely new ideas on your sojourn in the sun and it’s been great to see the results. Two amazing landscape and I am not amazed that you want to capture their strange beauty. And you do this with such a sharp eye and understanding of your own vision, that you always end up making something very special. That’s very kind Otto! Thank you very much indeed! Thank you very much! 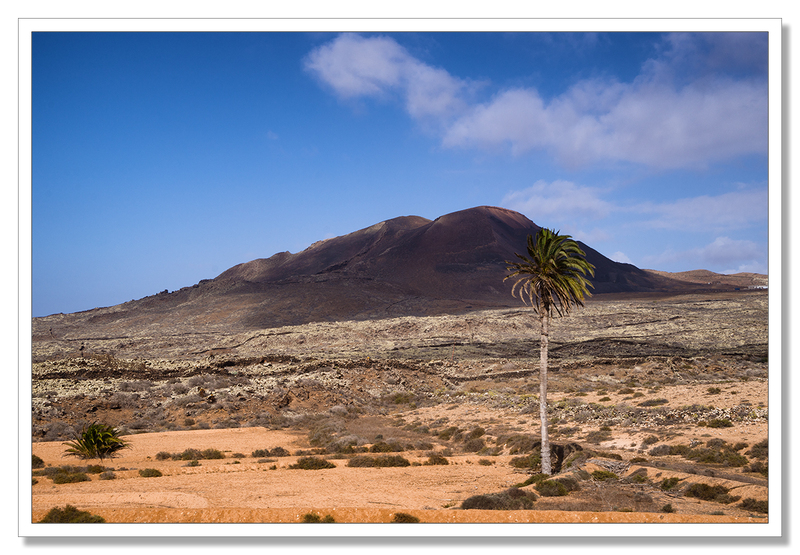 :-) Fuerteventura provides for some amazing landscape to be photographed! I’ll remember that, never thought the landscape looks so good there. The light on the mountains, particularly early in the morning or late afternoon and dusk is stunning bringing a great deal of beauty to the very arid and barren landscape. These landscapes remind me of the ones where I grew up, in southern Nevada in the USA. I have no desire to live in such a climate again, but I can still admire its stark beauty. Such very different perspectives but both beautiful. It reminds me of the Judean desert.